An editor who has overseen ten weekly newspapers for the past two years has quit to start a new career in public relations. Stephen Stray, left, who has served as Johnston Press group editor in Lincolnshire since 2015, is leaving the company. 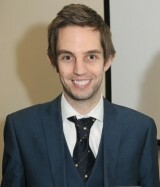 Stephen has edited the Boston Standard, the newspaper where he began his career, since 2011, and took on additional responsibilities in 2015 following JP’s ‘Newsroom of the Future’ restructure which saw the number of editors at its East Anglia and East Midlands titles reduced from seven to three. As well as the Boston Standard, Stephen had overall responsibility for the Lincolnshire Free Press, Sleaford Standard, Skegness Standard, Spilsby Standard, Louth Leader, Mablethorpe Leader, Market Rasen Mail, Spalding Guardian and Horncastle News. He announced his departure in a farewell column on the Boston Standard’s website, in which he reflected on his 15 years working as a journalist in Lincolnshire – with memories including the newspaper’s office being destroyed by flooding in 2013. Wrote Stephen: “We always aim to be at the heart of the news, but with it being so close to home I am not ashamed to admit the emotions that night got the better of me. “I was immensely proud of the team, as I have always been, of the coverage we provided and also the fact we were able to honour, in some small way, the contribution of the community in getting people and businesses back on their feet. “And that is what the Standard is all about – being a part of the community it serves. It has done that for more than a century, and it was an honour to be the editor when the paper celebrated its 100th anniversary. On Twitter, Stephen told his followers that he would now be “trying my hand at PR” and would be based in Durham and Newcastle. Stephen began his career at the Boston Standard in 2002, before switching to serve as chief reporter in Skegness and Spilsby in 2006. A year later, he returned to Boston to serve as news editor before being promoted to acting editor in January 2010. He was given the role on a full-time basis in July 2011. In his goodbye column, Stephen concluded: “I was also proud to see the title defy the odds and be crowned Newspaper of the Year at the inaugural Johnston Press Awards in 2012, and a year later be highly commended in the Website of the Year category at the East Midlands Press Awards. The latter accolade is a clear nod to the contribution we make to the growing online audience. “The Standard has had to move with the times, and while we strive to make the much-loved print edition the very best it can be, the digital age in which we live now means people expect to see the news as soon as it happens. “And that is a challenge the paper continues to meet – often the first and trusted port of call when news breaks in the area. Our growing presence on social media has also been a great platform to ‘debate’ with readers. Overseen ten weekly papers? No wonder he is off. good luck to him. ‘Editor of 10 weeklies quits for new career in PR’ is a terrible reflection on local journalism in so many ways. Good luck to Stephen. It sounds like he deserves it. Out of the frying pan and into the clover. Ah the lure of PR. Poacher turned gamekeeper but good luck to him. It is such a shame that journalists have to become the ones ‘creating’ the news rather than searching it out but these days who blames them? Good point Hal the Gal. One plus is that ex hacks (well most) know how to write news and the standard of stuff from councils, cops, etc has improved. You can still spot those who were selling the miracle of soap in a past life though. If ever a story summed up the state of the industry it’s this. Moving into PR from journalism – check. Editing (far) more than one title – check. And a manager who looks – with all due respect – very young – check. J Jonah Jameson couldn’t edit 10 papers, it’s an absolute joke. It’s starting to get like Mexico where they appoint hedgehogs as the chief of police or something because nobody wants the job.